Answer a personal ad, BUT it was Friday evening, and I was lonely. I knew if I didn’t try something new, I’d remain single forever. So I answered one ad. It actually worked. Seven months later I married that man! Learn to be a writer, BUT at 34 I knew if I were going to continue up the corporate ladder, I’d need to quit relying on my oral skills and learn to write. So I chose a new job, where I’d write 80% of the time, forcing myself to learn. Now I’ve moved from business to personal writing as I complete my first memoir, Blind Curves. Climb a 20-foot ladder & jump, BUT when James Rollins, my instructor at the Maui Writers Fiji Retreat, told me I needed to describe my fears more vividly in my memoir, I was wordless. 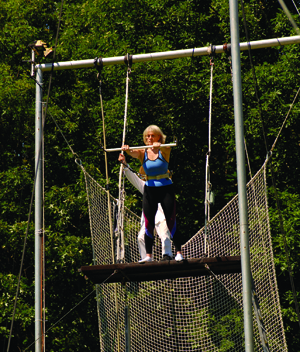 I enrolled in a 5-day trapeze course at the Omega Institute to intimately experience my fear of heights. It worked. I have never been more frightened or exhilarated. But that’s another story. Get up early when I don’t have to, BUT after a life as a diehard night person, I wondered if there was any truth about the beauty of getting a head start on the day. But my “to-do” list was daunting, and I wasn’t ready to add one more must-do. Instead I created my own “Wouldn’t It Be Nice to Wake-up Early” meditation. Soon I was leisurely drinking my coffee before the sun-up, smirking at my new-found time. Wish for cold weather, but when friends needed a fourth for a discount on a ski-trip to France, I learned to downhill ski in spite years of stating that my favorite winter sport was a fireplace, a glass of pinot noir, and good jazz. Now every winter morning, I check the daily weather report, hoping it’s cold enough for snow. Sound like my mother, BUT the older I get, the more I understand the wisdom in many things she’s said. Once I became a mother, I often called to apologize for things I did as a child. My mother is 87, and I still appreciate the lessons she is teaching us about how to grow older with courage and grace. Let go of trying to control life, BUT after becoming a widow and trying to control the remaining fragments of my life, I collapsed in defeat. By surrendering to what is, I realized the only real choice I had was choosing my attitude and not trying to control external events. My guess is that as you read my list, you thought of some of your own rules that you’ve broken. If so, share them in the comment section below. Make sure to add the “BUT” that made you break your rule. Maybe we can create a pitch to Oprah for doing a show on broken rules.